Current winners will be announced and features on the awards main page. Congratulations to all previous winners and finalists of the Consumer Protection Awards and thanks to all the nominees for their dedication to advancing consumer protection and injury prevention for children in Western Australia. 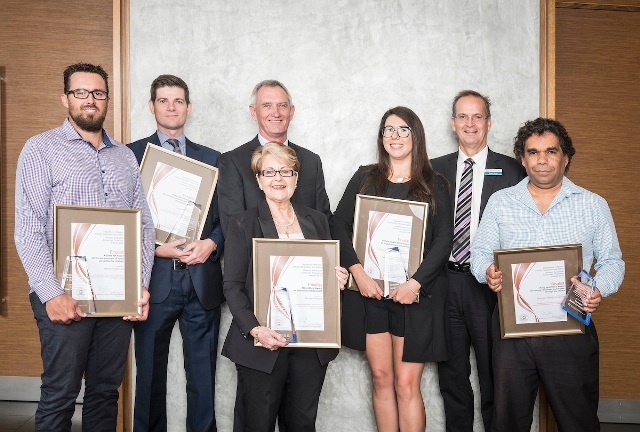 Congratulations to the winners and finalists of the 2018 Consumer Protection Awards and many thanks to all the nominees for their dedication to advancing consumer protection and injury prevention for children in Western Australia. L to R – Hon. Bill Johnston MLA, Nanette Williams, Ron Okley. Nanette Williams arrived in Karratha in January 1982 and since that time she has been a vital part of the community and its development. Nanette originally moved to the area to help establish the Community Health Centre. The project took six years and tremendous dedication to complete but was ultimately successful. Nanette's work with the Health Department progressed and she held the roles of Coordinator at the Karratha Community Health Centre, Hospital Administrator and Pilbara Regional Manager. During this time she was also involved in setting up the North West Regional Women’s Association, Women’s Health Centre and the Pilbara Social Justice Council. After 17 years working for the Health Department, Nanette accepted a role with the Pilbara Community Legal Service as a financial counsellor. After eight years she was appointed Chief Executive Officer and built the organisation from 7 to 30 staff, delivering services from four separate locations across the region. The Consumer Credit Legal Service is unique in Western Australia as the only community specialist legal service providing free assistance, advice and representation to Western Australian consumers in the areas of: home loans; banking transactions; debt collection; personal loans; motor vehicle finance; credit reporting; and the Australian Consumer Law. The service commenced operations in 1991 as a specialist, not-for-profit community legal centre, advising West Australians in the area of banking and financial services. They expanded their service 25 years ago to provide advice on consumer law matters. They provide a telephone advice line offering legal advocacy services for people experiencing credit and consumer issues and debt. In the last financial year, 2677 West Australians were provided with their free legal advice. Nature Playgrounds was founded in 2013 after Stewart Winsor’s landscaping company was approached to help build a nature playground project. The plan for the business was to supply safe quality materials to construct their playgrounds, while also providing a much needed supply chain for other businesses. Nature Playgrounds is now a leader in design, supply and construction of nature based playgrounds for early learning centres, schools, public spaces and private use. Their product range has quickly expanded from the basic logs and steppers to custom forts, musical instruments, hand water pumps, flat packed vegetable/herb gardens and playground games. Now delivering products and services Australia wide, they deliver a safe, quality product that will stand the test of time in a playground setting. Daniel Emerson graduated from Curtin University in 2002, beginning his career at Community Newspaper Group in 2003 before securing a cadetship at The West Australian in 2005. He worked as a rounds man and online journalist before being posted to State Parliament bureau. He left briefly to travel and then returned to The West Australian and state politics. In 2011, he became the President of The West Australian parliamentary press gallery. Daniel has followed the progress of ‘Project Sunbird’ – a joint effort between the then Department of Mines, Industry Regulation and Safety and WA Police and reported on the challenges facing the future of the project. Noongar Radio (100.9FM) is Perth’s only Aboriginal community radio station which provides a safe space for Aboriginal and non-Aboriginal people to listen, communicate and share their stories. Noongar Radio provides diverse programming suitable for listeners of all ages and is home to a family of producers, staff, broadcasters and volunteers alike. Station hosts include Jeff Michael and Perth’s first Aboriginal voice of Australia, Jeremy Garlett. Music of all genres is played, particularly First Nations music, and the station has a wide variety of listeners. Over several years, Noongar Radio has offered Consumer Protection a dedicated weekly spot on their highest rating program, Drive with Jeff Michael. The show aims to promote fairness and equality among its listeners. Karen commenced work in the community legal sector in 1994 following a move to the city from the north of WA. She was employed as an Advocate at the Welfare Rights and Advocacy Service, initially for twelve months, and then as the Project Officer to set up to the Northern Suburbs Community Legal Centre (NSCLC) in Mirrabooka. The Centre commenced operations in 1996 with Karen as the inaugural Manager, a position she has maintained for many years. During that time the Centre has grown from the initial small Mirrabooka office to expand to three centres located in Mirrabooka, at the Edith Cowan University in Joondalup and also at Wanneroo. The organisation has 20 employees including nine lawyers , a nurse advocate, a client advocate, two tenancy workers and one lawyer/educator all supported by excellent and capable client service officers. NSCLC delivers advice, advocacy and represents to over 3,800 people per year. In addition, each year staff conduct over 100 education sessions for members of the community. The development of a partnership with the Edith Cowan University School of Law provides law students with the opportunity to undertake a community law course and spend time working in the Centre. Up to 15 students each year are provided with the chance to further their career through graduate law placements at NSCLC. A number of students are now community lawyers working in other community legal centres, private firms and across government. The Midland Information Debt and Legal Advocacy Service Inc. (Midlas) is a not-for-profit community legal centre offering free financial, emergency relief, legal, tenancy and disability advocacy and information services. The Centre has had over 25 years’ experience in developing, delivering and managing programmes for vulnerable and disadvantaged consumers within the Northeast region of Perth. There are five essential programmes offered including financial counselling, tenancy advocacy, disability advocacy, emergency relief, and a family and domestic violence legal service. Midlas has been consistently selected to provide programmes to the community and is funded through multiple State and Federal sources. Although Midlas engages with vulnerable clients from various cultural backgrounds and life circumstances, their nomination for this award has focused on their support for clients with a disability. Working across service areas, the Centre staff aim to empower people with a disability to access fair and equitable information and to assist them to make informed choices when it comes to the purchase of goods and/or services. Guided by their Disability Access and Inclusion Plan, the Centre promotes the rights of people with disability and provides tailored services and customised delivery in line with the United Nations Convention of Rights of Persons with Disabilities and the National Standards for Disability Services. Goodstart Early Learning (Goodstart) is Australia’s largest early learning and care providers, with 647 centres in all states and territories of Australia. They are a not-for-profit social enterprise with 13,500 staff who care for 71,500 children from 60,000 Australian families. Goodstart are reinvesting the surplus funds from their centres back into improving quality of early learning for all children and access for children who are vulnerable. Goodstart was founded with a vision for all Australia’s children to have the best possible start in life. Goodstart in WA has the opportunity, in fact they believe an obligation, to advocate for the 6,100 children and over 5,300 families that use their early education and care services. Safety is reflected in their organisational overview and is integral to their operations, however in addition Goodstart also see their role in being to offer an important and trusted conduit of information on child safety to their client families, regulators and the broader community. Goodstart’s size and scale in WA comprising 52 early education and care centres, provides them with a unique opportunity to engage with 5,300 families about child safety. They provide services to children aged 6 weeks to 6 years old, the ages where children are universally recognised as being vulnerable to injury as they learn, explore and grow. Their broad geographical spread of centre across WA means their messages can be shared far and wide for the benefit of all children and families. They see this as an inherent obligation and part of their core operating ethos as a not-for-profit organisation and good community citizen. As the ABC’s consumer affairs reporter, Amy files nationally to a broad range of news and current affairs programs across the network. The Consumer Affairs round was introduced in 2013, and Amy has since grown in the role as she continues to expose wrongdoing and promote the rights of consumers. Amy has an excellent knowledge of Australian Consumer Law and has reported in a wide range of issues affecting WA consumers, as well as for consumers in all parts of Australia. These include stories on property investment schemes, scams, financial fraud, the national Broadband network, product safety and the solar industry. All these issues have been important to WA audiences, particularly those in rural and remote communities. Amy uses social media to connect with young people, and is now helping to produce Facebook videos with simple consumer messages. Jacaranda Community Centre offers counselling and support for people experiencing financial and welfare difficulties. It was initiated by Aboriginal people wanting an organisation where they felt they could belong without it being a solely Aboriginal organisation. The Centre aims to meet the needs of people on low incomes, regardless of family circumstances, gender or race. The Centre also provides financial management training, emergency relief, referrals to other support agencies and assistance with consumer credit issues and rent-to-buy schemes. Finalists: Midland Information Debt and Legal Advocacy Service Inc and Northern Suburbs Community Legal Centre. ATCO Gas Australia delivers natural gas to over 700,000 homes and businesses in Western Australia. The company’s commitment to keeping consumers safe saw the development of the ATCO Gas Australia Blue Flame Kitchen School’s Program. This interactive program piloted in 2014, provides gas safety education to school children in years five and six. Students are shown how natural gas is delivered, given tips on how to use gas safely and gain useful kitchen skills. Take home material booklets include safety messages and helpful hints around the use of natural gas, the importance of servicing appliances and what to do if gas is smelt. Annabel is the property reporter at The Sunday Times and PerthNow. In 2015 she conducted a three month undercover investigation into WA’s property investment seminar industry. Her story exposed some of the methods used to lure property investors and the unscrupulous techniques used to sell property. The warning featured in a double page spread in The Sunday Times and on the PerthNow website. Annabel has also worked with Advocare to alert consumers about property related elder abuse and the potential financial pitfalls that could occur. For more on the 2015 presentation ceremony read our media statement. Details about the 2014 Award finalists are in our media statement about the shortlist. There is also a Ministerial Media Statement about the winners.